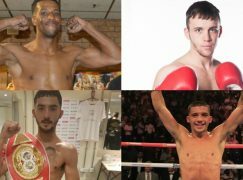 Lee Selby wants to join Joe Calzaghe as a Welsh boxing great – and says that journey begins on Saturday with European Featherweight title glory against Rendall Munroe at the Motorpoint Arena in Cardiff, live on Sky Sports. The Barry stylist has been on a fantastic run of fights, seeing of seven top class fighters on his way to his clash with Munroe. The former World title challenger from Leicester is confident of becoming a two-weight European champ and taking Selby’s British title in with the bargain, but his host expects to shine on his first ever pro outing in Cardiff and wants to emulate the great World champions of Wales like Calzaghe. “The show has sold really well and a great win means I will headline here again and again,” said Selby, who tipped the scales at 8st 13lbs 8oz, with Munroe weighing 8st 12lbs 5oz. “It would be nice to have the recognition of Steve Robinson, Robbie Regan and Joe Calzaghe who all fought a lot in Wales and did amazing things for the sport and the country. This is big-time boxing and this is what Wales needs. “Being on top of a Sky Sports show is something you dream of as a kid. I don’t feel the pressure so it’ll be nice to have the fans behind me. It will be nice to be cheered into the ring instead of booed. It will be nice to be built up in front of my home crowd and build up a good following in Wales. “Rendall was a great fighter. I remember boxing on the undercard of him and Kiko Martinez (February 2009). I watched the fight and I thought it was brilliant. But he has been at his best and I think it is my time now to take over. “Rendall travelled to Japan and came up short in a World title fight against a great fighter and got stopped by Scott Quigg, who is another great fighter, so he knows how to mix it at the top, but I’ve been working on things in the gym to get him out of there. I think it’ll be a very competitive fight early on but my class will show in the later rounds. “He is fighting at a higher weight now and I am a massive Featherweight; I am big and strong so I can’t see him being as strong as me. Back in the day he was hungry but I don’t know if he still has the hunger and the desire – he has already retired once and come back. Let’s see how much he wants it. “I am at the top of my game at the moment. I will be too much for him. He last two fights are against an eight-fight novice and the other had won three fights out of 60, and then he is going to jump in the ring with me? That is a different fight altogether. “I had a tough 2013. I had four twelve round fights and I think it took its toll. It wasn’t the fights, it was the camps. My sparring partners are tougher than my fights because they are all heavier. But I have had a nice rest, regrouped and I am ready to do the business. “I’ve been on the road most of my career. Even when I started off I was going away as the opponent against the home fighter. I either like to be hated or have all the fans on my side, either way I perform to my best. “I want to fight for a World title, that’s every boxer’s aim but I really believe I’m closing in on that now. I think I would hold my own against any Featherweight out there right now, but I don’t want to just challenge for a World title I want to win it and keep hold of it. So I want to be ready to do just that, reach the top and stay there.” Selby’s clash with Munroe tops a brilliant night of action in Cardiff, with a tasty all-Welsh British Lightweight title eliminator between Gavin Rees and Gary Buckland one of many highlights. Olympic Gold medal hero Anthony Joshua MBE fights for the fourth time in the paid ranks against Aberdare’s Dorian Darch while Jason Cook meets Tony Pace for the Celtic Welterweight title. 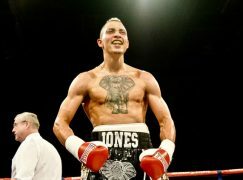 Prizefighter Light Welterweight champion Chris Jenkins is in action as is former European Middleweight champion Kerry Hope, and Islington’s former British Light Middleweight title challenger Erick Ochieng faces a tough test in his first fight down at Welterweight against Dale Evans. Swansea’s talented Super Middleweight Tobias Webb tackles Nathan King in a six-round contest, with Bristol’s unbeaten Welterweight Tamuka Mucha in his seventh pro fight against Leon Findlay. Tickets are on sale now priced at £30, £40 and £60 ringside available from www.livenation.co.uk or by calling 02920 22 44 88, or from Sanigar Events on 0117 949 6699. VIP Packages priced £120 are available from www.matchroomboxing.com or by calling 01277 359900.